Ryan Crippen (aka Reactor-88) is a digital & traditional artist located in Los Angeles. 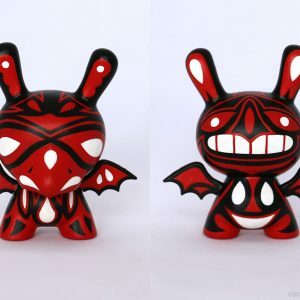 While his interaction design job pays the bills, during his free time he enjoys designing and hand-painting his own art toys. His other hobbies include 3D modeling, motion design, tinkering around with machinery & electronics, woodworking, and DIY home improvement. He also enjoys spending time with his wife and dogs, hanging out with friends, riding his motorcycles & mountain bikes, and just being close to the water. He caught the art toy bug back in 2005 while on a mission to get back into traditional painting. 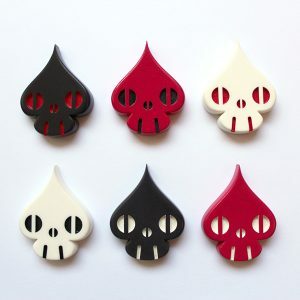 His Spade-Skull and Totem toy designs are highly sought after by toy collectors and he has been a fixture in toy shows & events in the U.S. and abroad. Q: Where did the name “Reactor-88” come from? Is it your grafitti/street name? A: I appreciate street art, but I have never been a grafitti artist. The name Reactor-88 spawned from a time when I was searching for a name for my portfolio website. The reactor part came from an abstract 3D digital art piece I created with a what I dubbed a mini reactor. Eighty-eight was an arbitrary addition just because it sounded too plain by itself- the number has no greater meaning other than it looks cool (like an infinity symbol) and sounded good together. Q: How do you paint such clean, crisp lines? Do you use masks and stencils? A: All of my line work is done by hand- no stencils or masks. I’m very patient and have many years of practice behind my artwork- I’ll attribute most of it to that. I do have some tricks I use to keep my hands steady- like a strategically placed pillow to support my arm sometimes. Q: Why do you paint Totem-looking toys and stuff? A: I love many styles of artwork, though I do gravitate towards traditional Asian, Polynesian, and Native American artwork. My “Totem” artwork came about from my love of totem poles and the various faces and symbolic design patterns that adorn them. In the hope of not offending their history and culture, I’ve tried to create my own stylized representations using more abstract colors and patterns. Please note in no way is my Totem art culturally accurate nor should it be mistaken for authentic tribal Indian artwork, per The Indian Arts and Crafts Act of 1990. Q: Are you Native American/Tribal Indian? A: Nope- I’m a Hapa (half Japanese / half Caucasian).